You produce work of a high standard Mark and your submission for this third part of the module is no different. I can see a steady progression in your practice and evidence of it further gathering momentum with the introduction to new disciplines such as the natural landscape. Just as in prior submissions you have also delivered an extremely precise and well-considered learning log. I am greatly encouraged by the quality of your work Mark and look forward to seeing your next submission. The preliminary studies and notation describe the developmental stages of the creative process heading towards your finished assignment piece very successfully. The consideration applied to the experimental trials for a suitable medium shows an admirable determination and engagement in the developmental process. 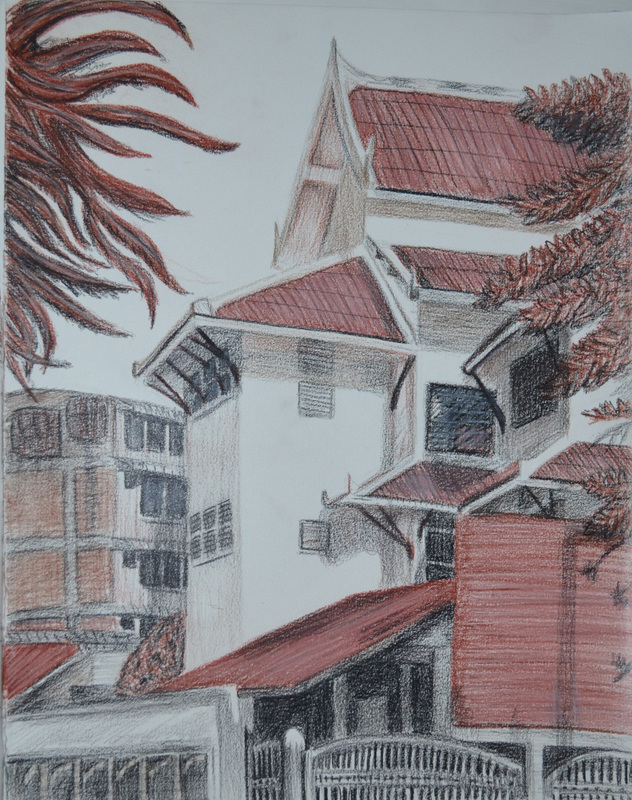 The finished drawing for the assignment is well composed and displays a thorough and successful understanding of the portrayal of single-point perspective. 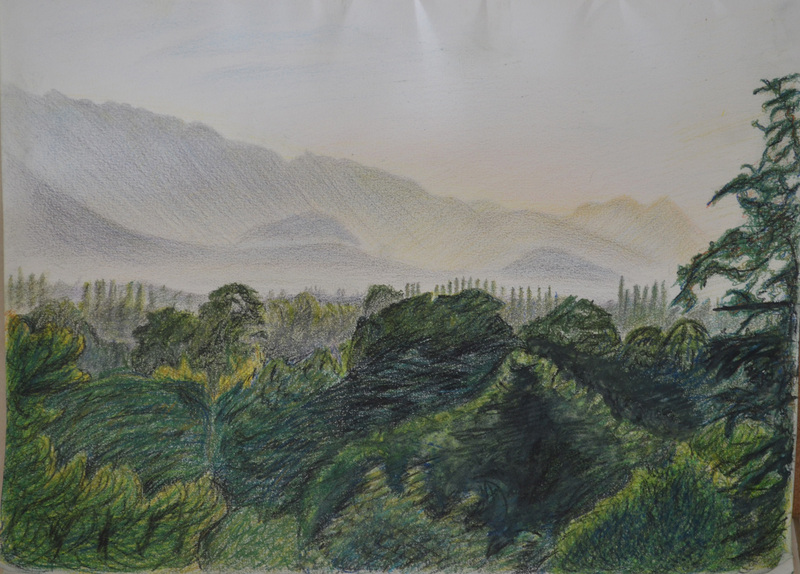 I think, on the whole, the final drawing holds together well and is a convincing depiction of the landscape. It displays a strong composition, a good portrayal of depth and your handling of the medium has been effective. My one criticism would be in the rendering of the foliage in the middle ground. I feel you could have been a little bolder in the depiction of the light and shade created by the layers of leaves, thus validating the ’bulk’ of the foliage and accentuating the illusion of a receding background. The lightness of touch has made it appear a little flat with regards form (light and shade) and this slightly affects the overall depth of the piece. Watercolour pencil can be quite a difficult medium to achieve ‘heavier’ or solid depth of tone due to its hard quality, but as you have accomplished this in the rendering of the roof supports, I feel you could have pushed it a little further. I wasn’t particularly happy with my submission for this third assignment nor the task for this assignment as finding a view that was suitable was very difficult. This could have been my favourite assignment if I was in the countryside or back home in Yorkshire but not in the built up area where I live in Bangkok. There were views with some of the above but not all, the view from the school window was the best I could do but I wasn’t really keen on it. 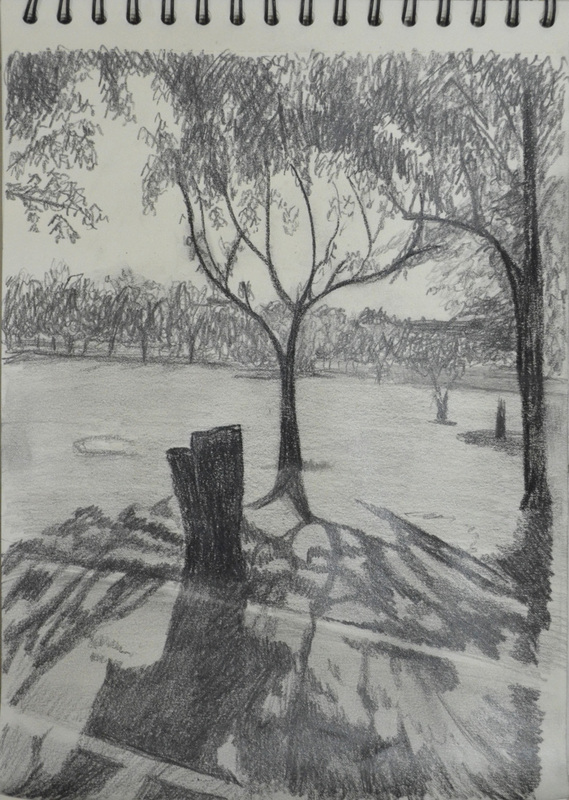 However, besides all this the tutor’s comments were very positive and he was right saying not being bold with the depiction of light and shade made by the trees has ‘made it a little flat’ and so with other drawings that need attention I shall try to give it some depth before assessment. You have continued to produce a thorough investigative learning log Mark. You honestly identify situations that have hindered you and are equally open about your successes. Although you mention in your notes for this part of the module that you were not overly excited by the prospect of drawing landscape you have proven to me, and most importantly to yourself, that you do have the ability to overcome this doubt. I was pleased to read that you found looking at the work of other artists (Claude Lorrain and J. M. W. Turner specifically) helpful, by recognising the importance of defining fore-, middle and background, and that you have employed those findings to your advantage. I get the feeling that not only due to your obvious growing abilities it is your determination, enthusiasm and wholehearted interest in drawing that will define your progress to me as your tutor, but most importantly to you. That realisation is patently the greatest benefit to even further progress! 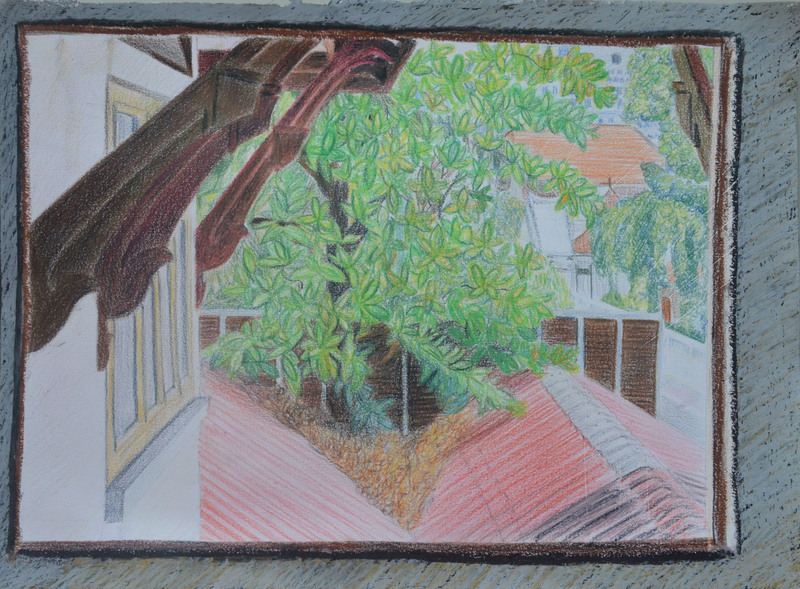 This part of the Drawing One module concentrated on working outdoors, or en plein air. Due to the unrest in Bangkok I’m sure the prospect of doing these exercises must have felt like particularly poor timing for you and been very difficult at the time! I must say however, even with these enormous obstacles, you have undertaken the exercises and the assignment very well indeed and have produced an extremely thorough and well-focused collection of work. Your drawing is strong Mark. The enthusiasm and engagement you put into the exercises shines through in the work you have presented. The ‘Sketchbook walk’ and ‘360 degree’ studies are dynamic and show a methodical understanding of how to portray the illusion of depth in a two-dimensional image. I particularly liked your fourth and final sketch for the ‘Sketchbook walk’ series: it is confidently rendered, very well observed and displays a solid understanding of perspective and composition. I must admit the drawing above was one of my favourite drawings from this exercise and I am thinking about enlarging it for my assessment….but will it work? It was also great to see you wholeheartedly taking on the challenge of new media for the ‘Drawing cloud formations’ exercise. You are lucky to be in a country where there is a defined difference between cloud and sky! The results were well considered in terms of their delineation – the most successful, and intriguing, for me were the night-time clouds on black paper. The drawing has something of the Odilon Redon about it. The developmental sequence for the ‘Plotting space through composition and structure’ exercise was transfixing and I think a very successful drawing. The perspective exercises again have been undertaken with confidence and have displayed a good understanding of the representation of both parallel and angular perspective. The angular perspective drawing is particularly well-observed. This thorough understanding of the rules of perspective is confirmed by the beautiful series of townscapes you have included in your sketchbook. These are excellent studies Mark that show wonderfully realised depth through perspective and the subtle but effective use of tone. I especially liked the ‘Limited palette’ studies. I am wondering whether or not to include this in the work for submission. It is probably a good choice as I have some great studies from the previous exercise. 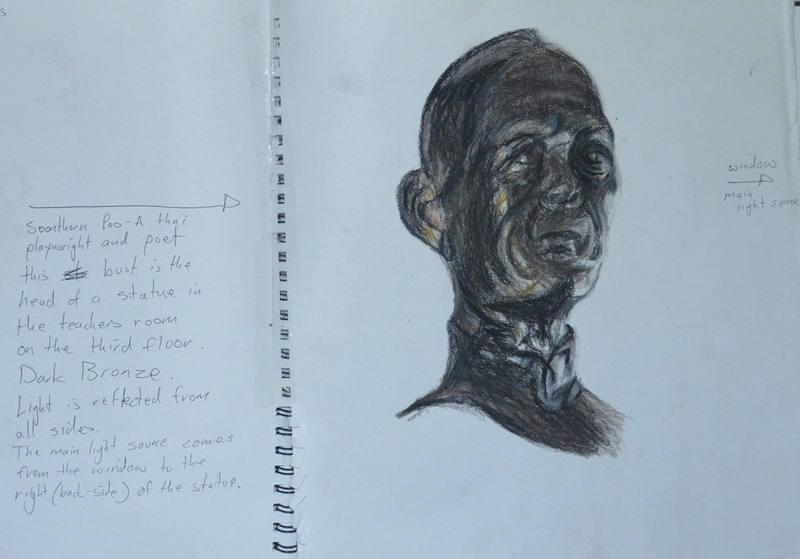 Your studies for the ‘Drawing statues’ exercise raises my expectations to see your work for part 4 of the module. These again are very well-observed studies. The conté and pastel study of the Soonthorn Poo bust has been beautifully realised, the solidity of the representation skilfully rendered. 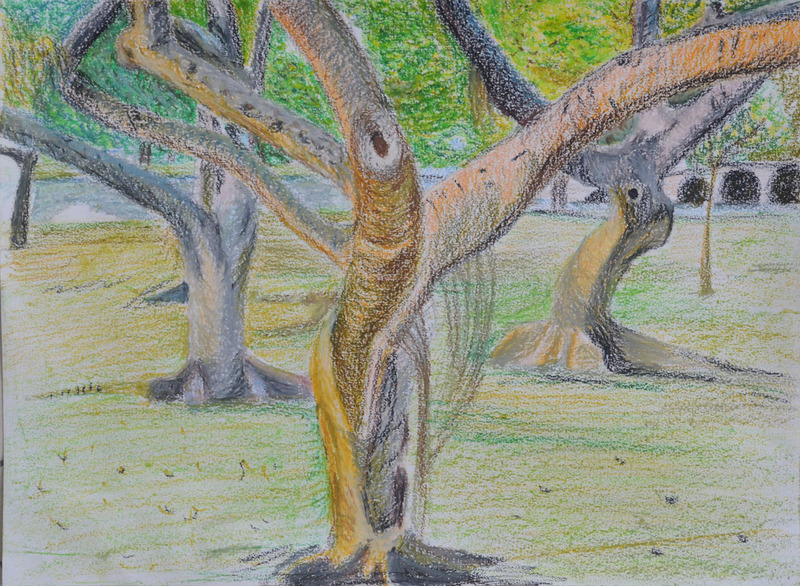 This is also true of the studies for the ‘Drawing trees’ exercise, particularly the larger study of the individual tree and strong oil pastel study of several trees – I agree, it does appear like an admiring nod to Georges Seurat. I couldn’t find About Looking without purchasing online but I was very lucky to find a copy of Ways of Seeing and exercised my new fresh view of seeing things in the research point Investigating Artists’ Self Portraits. As you know the next part of this module is all about the figure which I’m sure will suit you. Hold on to the enthusiasm and commitment you have shown and carry on looking and researching. It is evident that this way of working is very good for your practice. I look forward to seeing your submission for ‘Drawing figures’ Mark. I understand your aim is to go for the Painting/ Creative Arts Degree and that you plan to submit your work for assessment at the end of this course. From the work you have shown in this assignment, and providing you commit yourself to the course, I suggest that you are likely to be successful in the assessment.